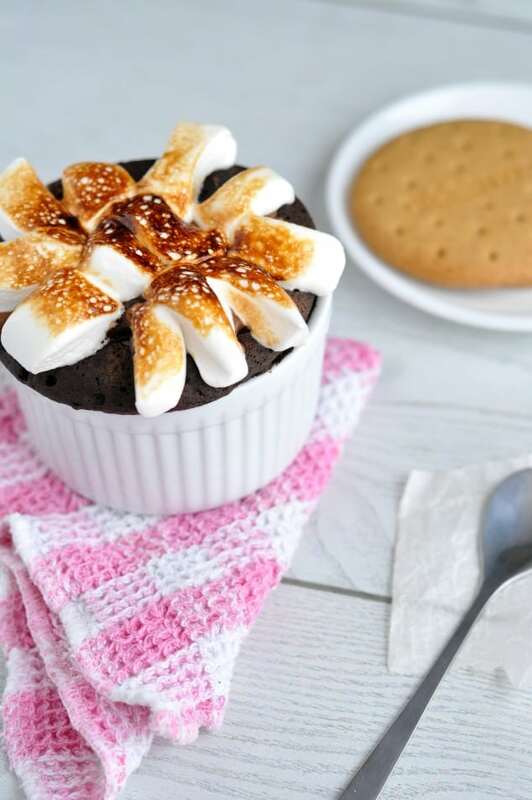 S’mores really are the perfect summer to fall transitional dessert, which makes this healthy mug cake the perfect thing to share with you on September 1st! There’s no hot oven to turn on (because it’s still way too hot for any of that nonsense!) and it cooks in just 60 seconds. How awesome is that? As you can probably guess, I never really gave much thought to the marshmallow placement. I kind of just threw them on then attacked the healthy mug cake marshmallow topping with the blow torch. Now I see it looks a bit like a weird flower, I wish I’d been more considerate. But you can only spend so much time on decoration when the smell of a rich chocolate cake hits you, right? I hope you’re not getting fed up of the s’mores recipes. 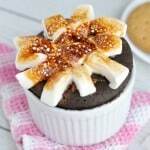 A couple of weeks ago I posted these Goodbye Summer S’mores Brownies and now this healthy mug cake. There’s just something about that marshmallow topping I can’t get enough of! The kitchen blowtorch only toasted the very top of the marshmallows, making them super crisp and crunchy on the top, but crazy melted and gooey on the bottom. It’s pure bliss, I tell you. And when the temperatures are as high as they currently are (we hit 99F / 37C today!) there’s no way I’m turning the oven on to make a real cake. Or even lighting a fire to make a proper s’more for that matter. 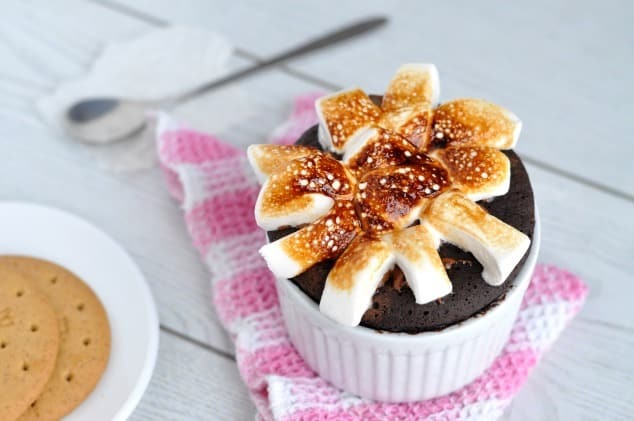 Nope, the only way I’m going to be getting my s’more fix any time soon is through this healthy mug cake. But when it tastes as good as it does, I really don’t mind! A light and fluffy chocolate cake topped with melted milk chocolate, crushed Graham cracker crumbs and toasted marshmallows. The best healthy mug cake recipe ever! In a small bowl, mix together the flour, cocoa powder, stevia and baking soda. Stir in the Greek yoghurt and scoop into a lightly greased ramekin or mug. Place in the microwave and cook for 60 seconds. Remove from the microwave and top with the chocolate chips and graham cracker crumbs. Sprinkle over the chopped marshmallow and blast with a kitchen blowtorch until golden brown. Alternatively, place under the grill for 2 minutes to toast the marshmallows. 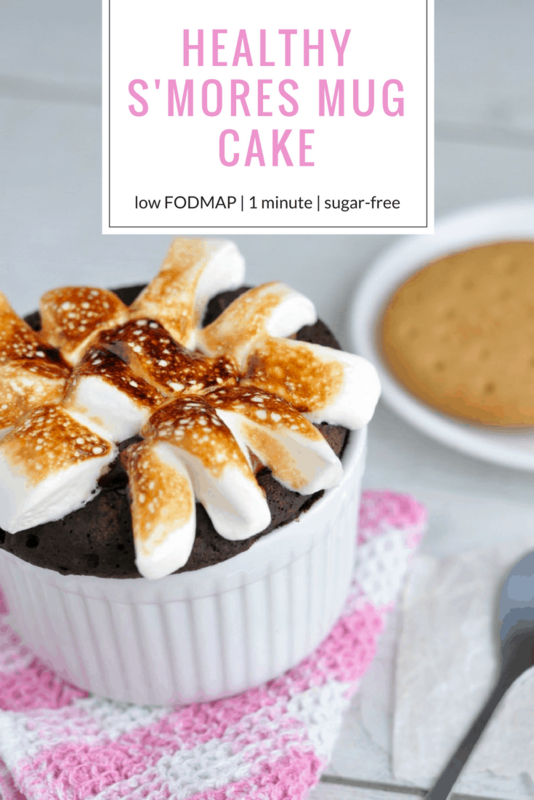 This healthy mug cake is low FODMAP and suitable for most IBS diets as long as you can handle Greek yoghurt, which is low in lactose. There is lactose in the milk chocolate chips and gluten in the graham cracker crumbs. But the quantities are so small that it shouldn't cause any IBS symptoms. I am gonna be selling my firepit soon so – when it comes to s’mores in any form – I’ll take all the microwave recipes! This look delicious – perfect for warm summer evenings indoors! If I had a firepit I don’t think I’d ever sell it! We’ve got a homemade one (aka a big plant pot we occasionally fill with charcoal) but microwave s’mores are just so much easier to make! My daughter, who loooves S’mores, just went away to college and would definitely enjoy making these in her dorm room! Thanks for the recipe! This looks so yummy, I love the idea of using yogurt to keep the cake moist. Thanks so much, Lizzie. And you’re totally right – the yoghurt adds to the moisture without adding to the fat content! I love marshmallows and chocolate together. It’s one of my favorite things. 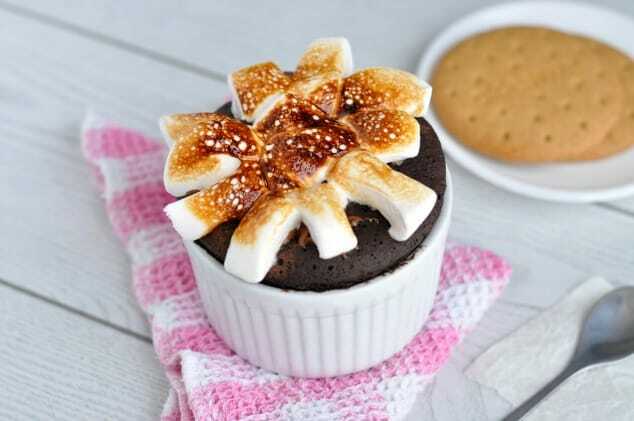 Your s’more mug cake looks so delicious. I can’t wait to make it! Thanks so much, Elaine. Chocolate and marshmallows have got to be one of the best flavour combos ever! Now this is a mug cake I can definitely not say no to!!!! Glad to hear it, Tina! I don’t think I’ve ever said no to any mug cake! !